my labor story : Part 3 | escaped. So she started settling us down in the labor room - a spacious room with CTG monitor, a comfy sofa (for the father-to-be, the nurse said), a table, cabinets with a sink, bath essentials and a 'container' where they put the baby. Came with a spacious bathroom for us too. She stripped me down to my undies and gave me a green hospital gown to wear. By this time, I was still having contractions so I just went along with everything - a bit drowsy too from countering with the pain. Hubs took me jalan-jalan around the labor room area, to take my mind off the contractions. Thank God it was peaceful (since it was 12 am at midnight). Had to pause at some point because of contractions. Some nurses told me to stay in the labor room if it was too painful to walk. I guess the real contractions were coming at this point. Couldn't walk anymore so I resolved to just lying on the bed, with my husband by my side giving me air zamzam and some kurma occasionally when I needed some strength. When the nurse came to check on us, I begged for some painkillers. "Bila boleh cucuk epidural? 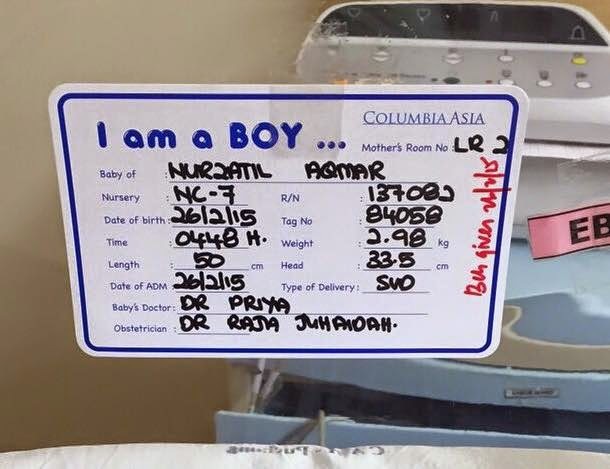 Saya nak epidural, tak tahan sakit"
I even had it in my birth plan - epidural is a must. "Awak baru bukak 3 cm, nanti sebelum sampai 6 cm baru kita bagi. Lambat lagi ni, first baby selalunya 1 jam baru bukak 1 cm..jangan layan sangat sakit tu, ingat Allah sabar ye"
Dude..can't you see I'm dying over here -_-"
"Kalau macam tu, saya nak painkiller lah kak. Tak tahan sangat ni"
"Ok, kalau nak painkiller, pukul 3 nanti saya datang bagi. Nanti lepas cucuk tu 6 jam baru boleh cucuk pulak, baik tunggu betul-betul sakit"
I seriously felt like flying kick this kakak. But she has the meds and I was already in too much pain to reply. The nurse came to jab me and check my cervix. Done with the painkiller jab, which I felt nothing (compared to the contractions). Then she checked my cervix. A bit painful from previous I don't know why. My husband's jaw dropped. I wanted to scream "I WANTED THE EPIDURAL YOU SHOULD'VE CHECKED SOONER NOW IT'S TOO LATEE" but nothing came out. The nurse went out of the room in a hurry; which I presumed to call the doctor and start setting us up for labor. I looked at my husband, unable to say anything - his face says it all to me. Can't believe everything is so fast! More nurses came. They set my legs up on the leg-opener thing, adjusted my back position, prepared the gas beside my bed and poked my hand with some long needle, I couldn't remember for what. The nurse told me my doctor is on her way. My doctor arrived. I was so relieved to see her face (albeit having all the contractions from my hip all the way down to the south area). One thing about my gynae is, she has this calm demeanor that makes everything feels okay. She came into the labor room, greeting me as usual as if nothing happened (and as if she couldn't see my legs spread so wide right in front of her nose -_-) and checking with the nurses some things. She began setting up her things and at one point, even humming -_-"
But it calmed me a lot, somehow. Was too tired to say anything at that point, because every time the contractions peak, I'd grab my husband's shoulder and hands and start panting. He'd watch the CTG monitor to check my contractions and every time it peaks, he'd give me air zamzam and kurma and tell me to be strong. Really felt as if I was dying. At 9 cm, the doctor broke my water bag - and from that moment, everything was blurry. Shahrul gave me the gas thingy every time the contraction peaks as per the nurse's instruction, but I don't think it worked because I was still very much in pain and was too exhausted. The doctor asked me to push. My baby boy was born! Alhamdulillah, everything was fine. The biggest challenge for me was to push because I was too exhausted from the pain, but the moment Shahrul said "ok we can see the head crowning already", it sorts of gave me some strength to do the final push. HAHAHA. Because of the blood, I presumed lol. It was certainly an experience we'd treasure our whole lives - made my husband cry, made me cry, made us value each other more than ever - and we have our little one to thank Allah for. Also for making the whole labor process a bit easier for me too - I can't imagine all those mothers who are in the labor rooms for 10, 12 hours with the contractions, waiting patiently to give birth. I just can't. Being in the labor room from 12 am to 4 am, waiting to give birth felt like eternity to me. And Allah certainly heard my prayers to give birth sooner; a day before my scheduled induction! Had all our families and friends who prayed for our smooth delivery too, Alhamdulillah. Can't believe I'm a mother now! To be honest, I don't think I'm completely maternal yet. Sometimes when I saw my husband looking at Rayyan all lovingly and kissing him all over, I wonder if I could beat that kind of true fatherly love. My first time pushing a human being out of my body, another milestone ticked. Congratulations zatil! Sounds like you've had a pretty smooth labour. Lucky youuu. Good luck with motherhood!